Billick’s Review: Who can come out of AFC Playoffs unscathed? Heading into this weekend, just four of 12 playoffs spots had been secured and only the Colts had clinched their division. After this weekend, there are now seven teams that are guaranteed a spot in the playoffs and every division in the AFC has identified its champion. In addition to the Colts, the Patriots have clinched the AFC East, the Bengals are the champions of the AFC North and the Broncos have won the AFC West. The Chiefs are locked in at the No. 5 seed as the AFC’s first wild-card team, leaving just one playoff position yet to be decided. In contrast, none of the NFC divisions have been won and just two teams, the Seahawks and the Panthers, have clinched a playoff berth. With a win tonight against the Falcons, the 49ers would be the third team to clinch their trip to the postseason. A 49ers loss would not only give the NFC West to the Seahawks, but Seattle would also clinch home-field advantage throughout. With just one week remaining, there is still plenty of jockeying left in regards to overall seeding, but with five of the six postseason teams identified, the AFC playoff picture has started to take shape. But just because these five teams were the first to punch their tickets, it doesn’t necessarily mean they are the clear favorites to represent the conference in the Super Bowl. New England Patriots (11-4): Clinched the AFC East for the fifth straight season and the 10th time in the last 11 years. Can clinch home-field advantage with a win next week and a Broncos loss. Why they will win: The Patriots have won 10 games for the 11th straight season, the second longest streak in NFL history. 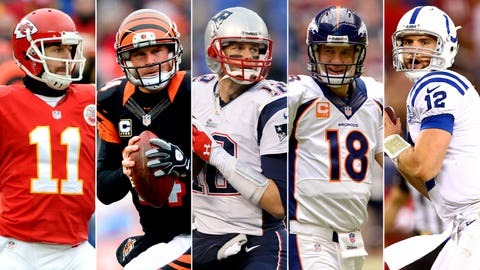 With the win this weekend, Tom Brady tied Dan Marino for the fourth-most wins by a starting quarterback since 1950. At 162-61, Bill Belichick is now an astonishing 101 games over .500 in his career. Plain and simple, the Patriots are winners and it would be foolish to bet against them. Why they won’t: The loss of Rob Gronkowski is a monumental feat to overcome for this offense. With Gronk, the Patriots were scoring nearly 12 more points per game and averaging an additional 51.4 yards, but it is his absence in the red zone that will hurt this team the most. Although the Patriots were a perfect 3-for-3 inside the 20-yard line on Sunday, they entered the game scoring touchdowns on just 38.5 percent of their red zone trips without Gronk in the lineup, the second-worst percentage in the entire NFL. Cincinnati Bengals (10-5): Clinched AFC North and will go to the playoffs for the third straight season for the first time in franchise history. Why they won’t: Andy Dalton has been both extraordinarily good and extraordinarily bad this season and it comes and goes, much like a streaky shooter in basketball. From Weeks 6 through 8, Dalton threw for more than 300 yards in every game with 11 touchdown passes and just two interceptions. Then from Weeks 9 through 13, Dalton averaged just 223 yards per game and threw just six touchdowns with nine interceptions, including two games in which he had three picks. Now, in the last three games, Dalton has nine touchdowns and no interceptions. The Bengals won’t survive if he goes cold like he did during that four-game stretch in November. Indianapolis Colts (10-5): Clinched AFC South and second straight playoff appearance. Why they will win: The Colts have more impressive wins on their resume than any other team this season. Indianapolis has beaten the 49ers in San Francisco and the Chiefs in Kansas City as well as wins over the Seahawks and Broncos at home. Assuming the 49ers win the final game to be played in Candlestick Park tonight against the Falcons, that will be four wins against four playoff teams, three of which have the best records in football. The 16-point win over the Chiefs this weekend is telling, considering they will most likely face off in two weeks in the AFC wild-card round. Although it’s counterintuitive to my argument, it should be stated, that in the 31 previous instances in which teams have played each other in the playoffs after meeting in the regular season in Week 16 or 17, the team that won the regular season matchup is actually just 15-16 in the playoff game. In addition to their impressive resume, the Colts are 6-1 in games decided by fewer than eight points, or one possession, and that gives them the best winning percentage in such games for the entire NFL. Playoff games are close with back and forth momentum swings, and the Colts have proven they will remain poised in that setting. Why they won’t: The Colts have been one of the worst first-half teams in all of football, and they can’t afford to get off to such slow starts in the playoffs. Of all the teams currently in line to make the postseason, the Colts have the worst margin of defeat, largely due to them being outscored 194 to 154 in the first two quarters. That is the worst first-half differential of all teams projected to make the playoffs and the sixth-worst overall. Teams will smell the blood in the water and will look to put the Colts out early and force them to become one dimensional with too big of a deficit to overcome in the second half. Denver Broncos (12-3): Clinched the AFC West for the third consecutive season, a franchise first. Clinched a first-round bye and can clinch home-field advantage with a win next week. Why they will win: This shouldn’t be a surprise to anyone. The Broncos can score in bunches and they have been doing so in record fashion. The 572 points they have scored through the first 15 games of the season are the most points for any team since 1940 and 21 more points than the second-place team, the 2007 New England Patriots. Speaking of those Patriots, with his four touchdown passes on Sunday, Peyton Manning now has 51 touchdown passes – breaking Tom Brady’s single-season touchdown record of 50 set in that same 2007 season. Manning is enjoying his first 5,000 yard passing season and needs just 265 to break Drew Brees’ single-season yardage record. But what makes this offense special is that they don’t always have to rely on Manning. They have a capable running game, led by Knowshon Moreno, that ranks as the 14th-best rushing attack in the NFL. This will be critical for the Broncos as the weather gets worse throughout the postseason, both in Denver and in New Jersey. Why they won’t: This also won’t surprise anyone. The Broncos defense is allowing 25.7 points per game and is ranked 22nd in the NFL. The 2011 Giants were the lowest-ranked defense to win a Super Bowl with the 25th-ranked scoring defense, but they actually gave up fewer points than this Broncos team. Teams will try to beat the Broncos with a controlled offensive attack in which they will attempt to keep the ball out of Peyton Manning’s hands by keeping it in their own. The Broncos have allowed a 100-yard rusher in seven of their last nine games and that isn’t a good sign for a defense that is trying to get off the field. To make matter worse, the Broncos’ best defender, Von Miller, left the Week 16 game in the first quarter with a knee injury and did not return. The Broncos need him healthy if they are to make a run at the Super Bowl. Kansas City Chiefs (11-4): Clinched the AFC wild card and are locked in to the 5th seed despite being tied for the second-best record in the conference. Why they will win: Despite the Chiefs only scoring seven points on Sunday, Jamaal Charles gives this offense a chance to score from anywhere on the field. The Chiefs had scored 17+ points in every game leading up to this point and had outscored their opponents 101-41 in the past two games. This offense isn’t as big of an Achilles’ heel as it is perceived to be. From Weeks 8 through 15, Alex Smith was averaging a respectable 227.1 yards per game with 16 touchdowns and just two interceptions. Charles leads the NFL with 19 total touchdowns and has 13 games this season in which he has totaled at least 100 scrimmage yards, also an NFL best. To me, the much more concerning number is that the defense, once thought to be the best in the league, has given up an average of 27.8 points in the past six weeks. Why they won’t: The Chiefs have beaten just two teams with a winning record this season, the Eagles and the Cowboys, and the two of them are playing to win the division next week. And even then, if the Eagles win, the Chiefs beat them when Michael Vick was still the starting quarterback. Either way, the Chiefs will have just one win against another playoff team this season. Sure, the Chiefs can only play the teams that are on the schedule, and going 11-4 thus far is impressive, but that doesn’t necessarily provide much confidence heading into the playoffs.